Montgomery County Public Schools is officially #ALLCAPS! The Washington Capitals are donating street hockey equipment to all MCPS middle and elementary schools. The equipment — which includes hockey sticks, balls, nets, and pucks — is all branded with the Capitals’ popular logo. 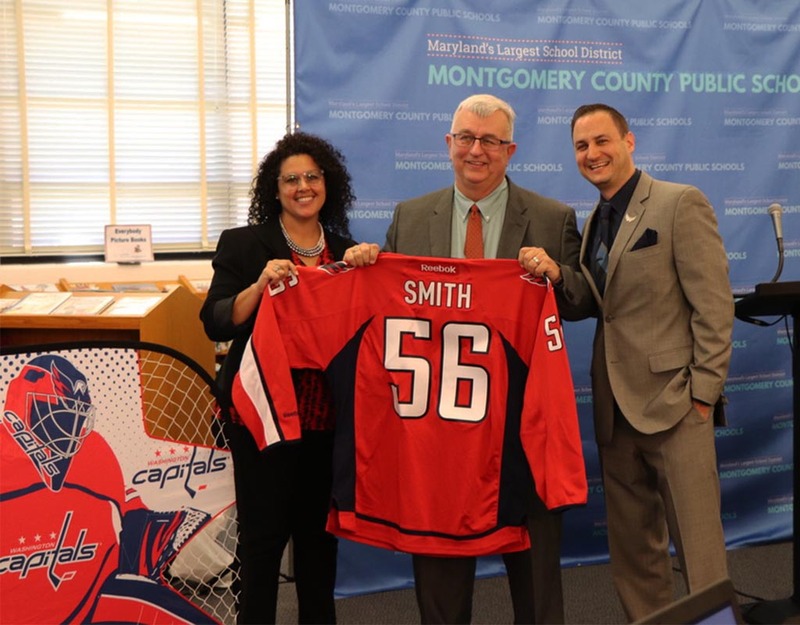 At Superintendent Jack Smith’s April press briefing at College Gardens Elementary School in Rockville, Cara Grant, the supervisor for MCPS’s health and physical education programs, said that MCPS’s physical education programs will be working with the Washington Capitals to develop street hockey into the PE curriculums. Robinson, a Sherwood High School graduate, said the Washington Capitals have brought this program to other school systems, but with this program coming to MCPS schools, they’ll be able to reach more students than they have reached previously. At the end of the press briefing, College Gardens Elementary students had the opportunity to test out some of the new Capitals street hockey equipment. All MCPS elementary and middle schools will have their Caps equipment by the end of the month. Robinson presented MCPS Superintendent Jack Smith with his own personalized jersey. Check out the presentation in the video below. Cara Grant, supervisor for pre-k through 12 Health and Physical Education, talks about the Washington @Capitals donation to @MCPS. She introduces Peter Robinson, Director of Community Relations for Washington @Capitals. Robinson is a graduate of Sherwood High School, so this donation to @mcps is especially personal to him.